I grew up building forts. I made forts out of branches and fallen trees. I made forts out of dirt. I made snow forts. I made very questionable forts out of abandoned buildings. I made blanket forts. I made pillow forts. I have made all sorts of forts. And I am proud to say I made Fort Boards®. Don’t get me wrong, I love a good blanket fort as much as the next person (pillow forts are just okay). The reasons why I love building blanket forts are the reasons that led me to creating Fort Boards®. I loved being able to hide away in a space all to myself. Or that I could customize this room within a room to have curtains or a secret escape hatch or a trap door for annoying siblings. I even loved when the roof sagged and I had to figure out where to tighten down the blanket. What I didn’t love was when it was dinner time and suddenly the base for my fort was needed again as their primary roles of dining room chairs. Or when someone wanted to actually sit on the sofa so those couch cushions were more important for them than my pillow fort. And I didn’t love that I couldn’t move my fort from inside to outside without getting in trouble for getting the sheets dirty. And I also didn’t love that besides making a questionable tent like structure I couldn’t really make anything else. With some string or rope, some clothespins, a sheet or blanket, and imagination (the most important part of any fort building kit!) I was still a little limited in what I could build. With Fort Boards® I wanted to make a fort building toy that could be used in the same way as my blanket forts and pillow forts. 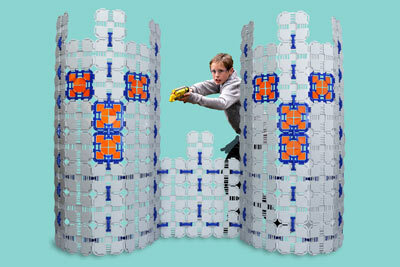 Kids could still build big structures that they could hide away in and customize how they wanted. They could still build a fort to sleep in at night or read a book in during the day. They could still learn engineering concepts and spatial reasoning as they adjust their forts for structural strength. And on top of all of that, now with these building panels they could easily move their fort from indoors or outdoors. Kids don't have to dismantle the fort at dinner time either! These parts look great so you can leave them up for a while or you can pack them neatly away because the parts nest into each other. And also they aren’t going to be limited to just forts! With Fort Boards® kids could build nearly anything. They can build castles and dragons and boats and whales and cars and so much more. I could never do that with my blanket forts and pillow forts. But now kids can with Fort Boards®. I’m so excited to see what they come up with.